Based on that glum-sounding post title, you might expect a sad and possibly whiny post to follow, right? 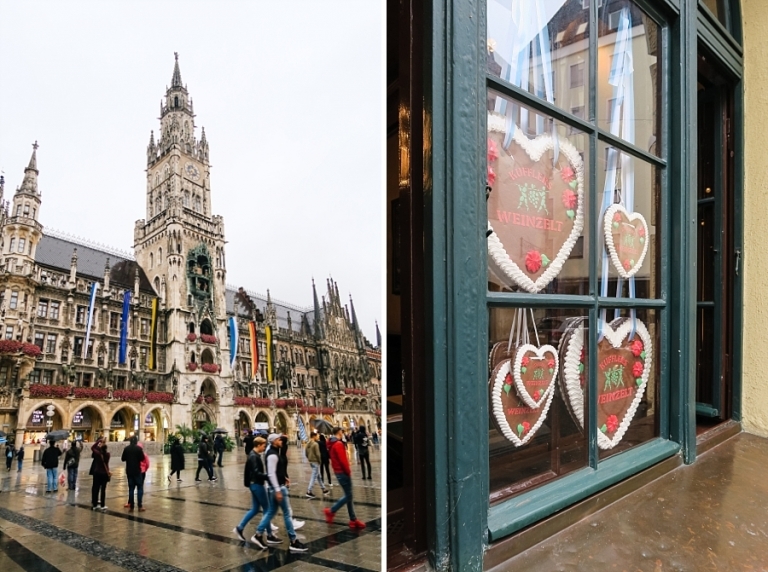 Chris and I did arrive in Munich on quite a chilly and soggy afternoon, and the weather remained completely dreary for the entire three days of our stay. But we planned this entire two-week trip around Oktoberfest, so we were determined to make the most of it and we had a great time! 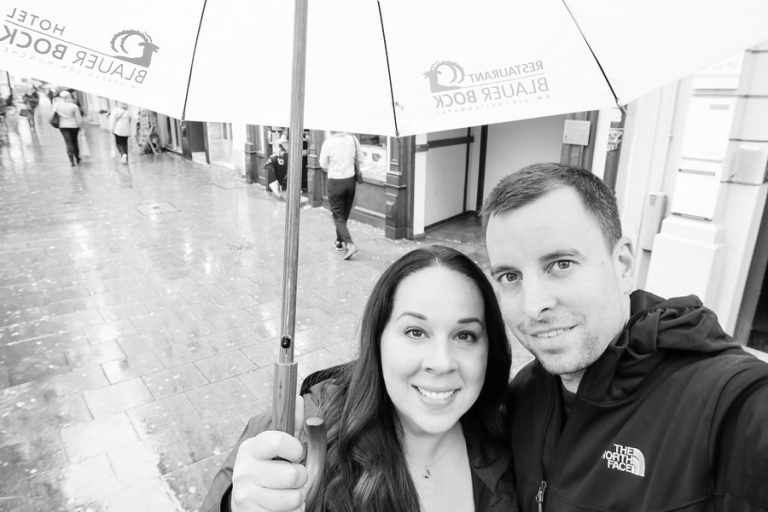 We are both well versed in dealing with less-than-favorable weather when we travel, and we have learned to just enjoy our time wherever we are regardless of the conditions. 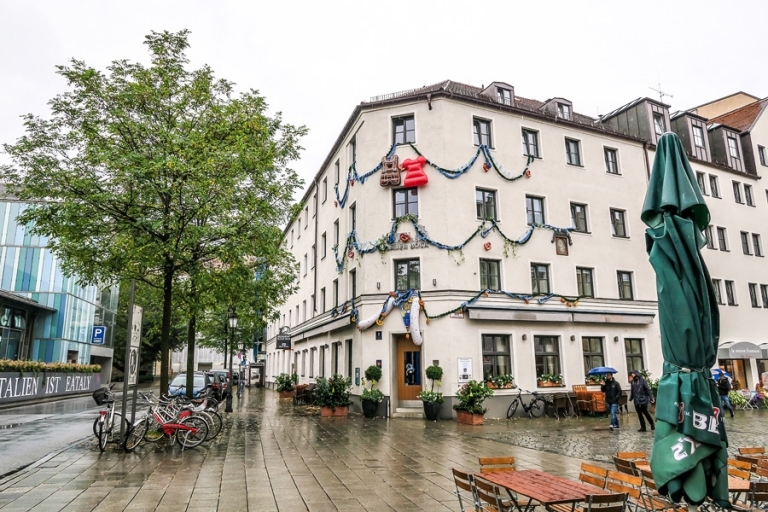 The wonderful front desk staff at Hotel Blauer Bock took us in from the rain and greeted us so warmly that we had no choice but to smile and feel welcome. Our room was fantastic, one of our absolute favorites from the trip, and we wouldn’t hesitate to stay here again for a future Oktoberfest redux. I lost track of how many times we borrowed their enormous umbrellas. 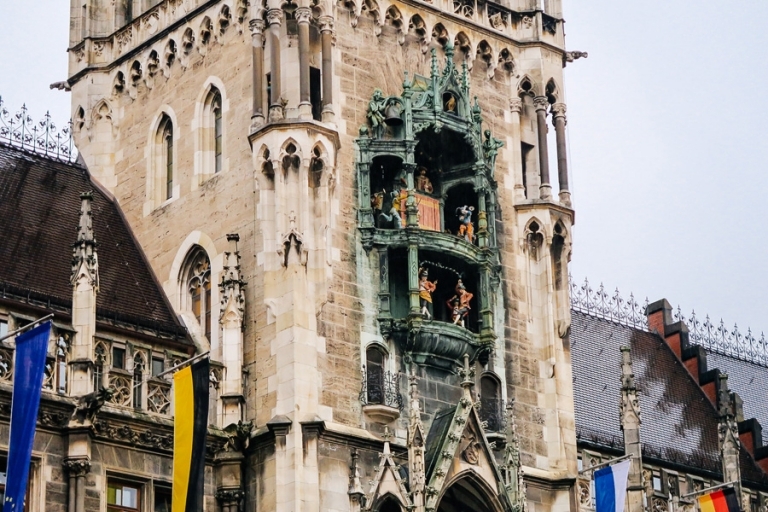 Being the fair-weather photographer that I am, I didn’t end up taking tons of pictures around Munich. I lazily snapped a few with my point-and-shoot or my iPhone, but I rarely bothered to lug my SLR around. It’s hard to photograph with an SLR while holding an umbrella and wearing a jacket that covers half my face! So I admit I’m not craaazy about my photos from this part of the trip, and that’s okay. I have these for documentation purposes and also the mental images that I captured with my brain. Click. Now let’s get to the part where the fun started – food and beer! If there is anywhere in the world I’d rather be on a cold and rainy day I can now say it’s Germany because of the comfort food and beer. 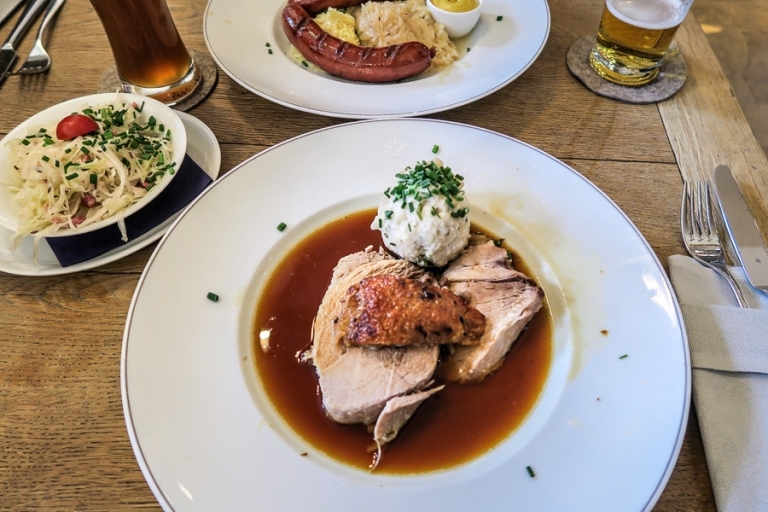 We delighted in the perfect excuse to stay cozy indoors with belly-warming goulash, schnitzel, bratwurst, braised meats, and of course beers, and we really only noticed the rain when we walked to-and-from our food and drink destinations of the day. One of the best things we ate (twice) called krapfen (the apricot jam-filled pastry pictured below) from Café Frischhut still drifts through my memories daily. We warmed up in preparation for Oktoberfest activities (you know, like stretching before a big run) on the first evening by hitting the Hofbräuhaus for beers, giant pretzels, and oompah music. Although it was packed with crowds continually streaming in, we managed to find seats next to and make friends with a big stag party. On Sunday morning of opening weekend, the traditional costume parade marches through the streets of Munich and my love for parades and costumes gave me the will to stand in the rain for over two hours straight in order to take pictures. I’m not ashamed to admit this was actually one of my favorite parts of Oktoberfest! So if you were a local marching in the rain and cold that day, know that I wholeheartedly appreciated your efforts. I was the girl (adult woman) in the navy raincoat with the goofy grin, jumping up and down waving back furiously. And these photos I do love! Speaking of costumes, as someone who loves to dress up I couldn’t resist the opportunity to wear a traditional dirndl at Oktoberfest. Only I’m also someone who is a complete wimp in the rain and cold. So I did a trial run the evening before our day at the fairgrounds when we hit up the beer halls again. Verdict: fun, but uncomfortable! I loved wearing the dirndl, but I was just too cold outside and knew I couldn’t spend the whole day wearing it at the Wiesn. Favorite dirndl moment? A group of tourists at Hofbräuhaus requested a photo with me – I felt like a celebrity! And for anyone else in The States who likes the idea of purchasing a dirndl or lederhosen prior to your trip to Munich or even for local Oktoberfest events, I ordered mine from Ernst Licht located in Pennsylvania. I didn’t want to spend a lot of time searching and trying them on in Munich, and Ernst Licht has a great selection of trachten wear online so I gave them a try. I was really impressed with the quality and their customer service! I ordered a couple of styles (they seemed to run true-to-size), and returns were super easy. I packed everything in my suitcase and just gave it a quick iron at the hotel. Voilà (or whatever the equivalent is in German), instant Bavarian girl. So the next day, a Monday, we headed over to the Wiesn in warmer, waterproof outfits. The fairgrounds looked soggy indeed, but now I know that it doesn’t matter much once you’re inside a beer tent. When I started researching Oktoberfest over a year in advance, I read the advice to make beer tent reservations in advance if you want to ensure a seat, especially on the weekends. I soon learned that tip applies to large groups only, and a party of two typically cannot make advance reservations for beer tent seating (at least not at the few I contacted). I fretted a little bit because we definitely wanted the beer tent experience, but we decided we would just arrive to the Wiesn early in the day and hope for the best. As luck would have it, we managed to find a spot right away around Noon. Warm and dry tucked inside the Löwenbräu tent, I chugged nursed my first mass of beer ever. The tent did completely fill up shortly after we arrived, so our timing really helped, but we popped in and out of a few other tents throughout the afternoon and I think we could have found a spot for two people here and there. Big groups definitely need reservations. Hotel Blauer Bock very sweetly gifted us tickets to the Zur Bratwurst “tent” where we filled up on delicious bratwurst and more beer while listening to a live rock band. The crowd here really got into the singing and dancing, so don’t miss out on the smaller tents if you’re looking for a fun vibe with a different feel! I liked the cozy atmosphere. The one thing we did miss out on due to the weather was flinging ourselves around on the roller coasters and carnival-type rides, which we love. It was just too cold and I’m not a fan of rain pelting me in the face at high speeds, so we took one spin on the Ferris wheel and called it a day. So if you ever find yourself in Munich for Oktoberfest during bad weather, have no fear because it is entirely possible to still have a great time! After three days in Munich for Oktoberfest we said aug wiedersehen to Germany and hopped back in the car towards Czech Republic where we had (spoiler alert) perfect weather. Those posts are up next!